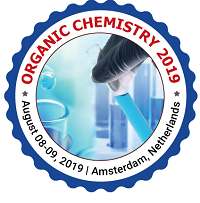 Research interests are mainly concentrated on organic chemistry, heterocyclic chemistry, photochemistry, medicinal chemistry, and the application of organic synthetic chemistry in the research of biologically important processes. Ionel I Mangalagiu is a professor of organic and medicinal chemistry and Vice-Rector with research at “Alexandru Ioan Cuza” University of Iasi, Romania. Previously, he has served as Dean, Vice-Dean, Head of Organic Chemistry Department, etc. at Faculty of Chemistry. He has nearly 30 years of experience in the research, focused in the area of Heterocycles Compounds. He has over 150 papers, 13 patents, 3 international chapter books, etc. He was Visiting Professor and/or invited speaker to prestigious foreign universities (Ludwig Maximilianus University Munchen and Technische Universität Braunschweig, University of Florence, Universite D’Angers), awarded with numerous prizes and honours: DAAD and NATO award, “Costin D. Nenitescu Medal” (Romanian Society of Chemistry), “Al.I.Cuza University Award in Research”, Special Award of Croatian Association of Inventors, etc. Professor of Chemistry at Virginia Tech. Received Ph.D. in Inorganic Chemistry from M.I.T. with Professor Dietmar Seyferth. Worked as Assistant Professor at Virginia Tech in 1987, became Associate Professor in 1991 and Full Professor in 1995. From 1998-2001, He held the position of Associate Dean for Research and Outreach in the College of Arts and Sciences. Cody Coyne is a professor of Molecular Pharmacology and Immunology in the Department of Basic Sciences within the College of Veterinary Medicine where he has established a research program devoted to the molecular design, synthesis and potency evaluation of pharmaceuticals. Current research investigations have been devoted to the design of molecular structure, organic chemistry reactions and multi-phase synthesis regimens for covalent immunopharmaceuticals with properties of selective "targeted" delivery and potent anti-neoplastic cytotoxicity. A native of Colorado, Coyne earned a DVM from Colorado State University in Fort Collins; completed a surgery internship, an internal medicine residency, and a PhD graduate degree (radiobiopharmacology design) at the University of California at Davis/Sacramento Medical Center, and attained board certification with diplomate status in the College of Veterinary Internal Medicine while at Kansas State University. Current research investigations have been devoted to the design of molecular structure, organic chemistry reactions and multi-phase synthesis regimens for covalent immunopharmaceuticals with properties of selective "targeted" delivery and potent anti-neoplastic cytotoxicity. Dr. Mirosław Kwiatkowski in 2004 obtained Ph.D. degree at the Faculty of Fuels and Energy, AGH University of Science and Technology in Krakow, in the discipline: chemical technology. Currently he is working an assistant professor at the AGH University of Science and Technology, at the Faculty of Energy and Fuels. His published work includes more than 45 papers in reputable international journals and 75 conference proceedings. He is the editor in chief International Journal of System Modeling and Simulation (UAE) and a member of the editorial board of internationals journals ie. Bulletin of Trends in Chemical Sciences (India), International Journal of Computational and Theoretical Chemistry (USA), Material Science and Engineering with Advanced Research (UK), Journal of Integrated Technologies (USA), International Journal of Petrochemical Science & Engineering (USA), Journal of Molecular Sciences (USA), Journal of Waste Recycling (USA), Journal of Forest Research (USA), Journal of Pharmaceutical Chemistry & Chemical Science (UK), Journal of Advances in Nanomaterials (Hong Kong), as well as a member of the organizing committees international conferences in China, Thailand, Poland, Iran, UK, Ireland, UAE, USA, Japan, France, Malaysia, Singapore, Spain and Italy. Dr. Mirosław Kwiatkowski is also a regular reviewer in a reputable scientific journals - among others: Chemical Engineering Journal, Journal Colloid and Interface Science, Environmental Processes, Energy Technology, International Journal of Chemical Reactor Engineering, Interational Journal of Hydrogen Energy, Iranian Journal of Chemistry and Chemical Engineering, Journal of Analytical and Applied Pyrolysis, Journal of International Journal of Computational and Theoretical Chemistry, Journal of Environmental Chemical Engineering, Journal of Physical Chemistry, Journal of Saudi Chemical Society, Microporous and Mesoporous Materials, Langmuir, Journal of Natural Gas Science and Engineering, International Journal of Petrochemical Science & Engineering. Apart from scientific work Dr. Mirosław Kwiatkowski also does some teaching. Runs classes on computer calculation methods and data analyses, numerical methods, chemistry, management in companies, and is a tutor of a student scientific society called “Green Energy”. Yuichi Shimazaki was born in 1970 in Toyama prefecture, Japan. He received his Doctor’s degree in science from Nagoya University in 2000 under the supervision of Professor Osamu Yamauchi. He joined Professor Yoshinori Naruta’s group at Kyushu University as Assistant Professor and worked on the redox behavior of various metal porphyrin complexes as models of the active site of metalloenzymes. In 2008 he was promoted to Associate Professor at the College of Science, Ibaraki University. His research interests include the oxidation chemistry of the complexes of various metal ions, model studies of metalloenzymes, bioorganometallic chemistry, and weak interactions in metal-organic molecule systems. Prof. Dr. Zanariah Binti Abdullah is a Dean of Faculty of Science, University of Malaya. She has earned PhD from UNIVERSITY OF LONDON, UK. Rocío Gámez-Montaño, has got her PhD under guidance of Professor Raymundo Cruz -Almanza from Universidad Nacional Autonoma de México UNAM, CDMX, México. After a Post-doctoral fellow under guidance of Professor Jieping Zhu in CNRS France, she was incorporated to Universidad de Guanajuato, México, where she is full time Research Professor (Class B). Her scientific research interest includes design and development of ecofriendly and green IMCR strategies toward the synthesis of heterocycles of interest in medicinal chemistry, optics, in vitro and in silico studies of biological properties, as well study of reaction mechanisms. Her scientific research interest includes design and development of ecofriendly and green IMCR strategies toward the synthesis of heterocycles of interest in medicinal chemistry, optics, in vitro and in silico studies of biological properties, as well study of reaction mechanisms. Narayan S Hosmane was born in Gokarn, Southern India and is a BS and MS Graduate of Karnatak University, India. He obtained a PhD in Inorganic Chemistry in 1974 from the University of Edinburgh. After Post-doctoral Research in UK and in the USA (UVa), he joined Virginia Tech and then moved to SMU in 1982, where he became Professor of Chemistry in 1989. In 1998, he moved to Northern Illinois University as a Distinguished Research and Board of Trustees Professor. His international awards include but are not limited to the Alexander von Humboldt Foundation’s Senior US Scientist Award twice; the BUSA Award for Distinguished Achievements in Boron Science; the Gauss Professorship of the Göttingen Academy of Sciences, Visiting Professor of the Chinese Academy of Sciences and Foreign Member of the Russian Academy of Natural Sciences. He has published over 320 papers in leading scientific journals and is an author of five books on boron science and cancer therapies. Bhanu P S Chauhan is a Professor and Chairperson of the Chemistry Department at William Paterson University. He rose through the ranks of Assistant and then Associate Professor at City University of New York at the College of Staten Island, (CSI) before moving to his present position. He served at CSI as a Co-director of Center for Engineered Polymeric Materials as well as a one of the Member of CUNY Institute for Macromolecular Assemblies. He has co-authored various world-wide patents and numerous peer reviewed publications and have delivered plenary, invited, and oral presentations at national and international meetings. He has also edited a book titled Hybrid Nanomaterials, published by Wiley. Currently, he serves as an Editorial Board and/or Editorial Advisory Board Member of seven peer reviewed journals including Applied Organometallic Chemistry and Silicon. He has also been an Advisory Board Member of American Chemical Society-New Jersey Polymer Topical Group. His research interests bridge traditional disciplines covering several aspects of synthetic inorganic, materials and polymer chemistry. Xie Linghai is a Professor of Organic/Polymer Materials Chemistry at Nanjing University of Posts and Telecommunications. He obtained his PhD from Fudan University in June 2006. After this, he joined Nanjing University of Posts and Telecommunications and become a leader of the Center for Molecular Systems & Organic Devices. He won the NSFC Award for Excellent Young Scholar in 2013. His research activities focus on molecular installing technology, synergistically molecular attractor-repulsor theory, polygrid-based wide-bandgap semiconductors, organic electrets for memories and memristors. He has published more than 150 papers in reputed journals and has been cited by more than 2000. Rocío Gámez-Montaño is currently employed at Departamento de Ciencias Naturales y Exactas, Universidad de Guanajuato, Mexico. She was Associate Professor Investigator B during the year 2002-2003 and Associate Professor Investigator C during 2003-2009. She was Chair Professor Investigator A during the year 2009-2015 and Chair Professor Investigator B during the year 2015-present. She completed her Post Doctoral Fellow during (2001-2002) from Institute of Chemistry of Natural Substances, France with Dr. Jieping Zhu. She completed her PhD in Organic Chemistry in the year 2001 from National Autonomous University of Mexico (UNAM). Her major research are been under Fisicoqímica Polymer, Theoretical And Computational Chemistry, and Heterocyclic Qimica. Synthesis of heterocyclic compounds by reactions of multicomponent hybrid (RMC) and study of biological and optical activity. Synthesis One pot of nitrogen heterocycles via reactions of multicomponent and evaluation of their chelating properties of heavy metals. Synthesis of hybrid heterocycles by synthetic strategy: RMC (Ugi, Ugi azide, GBB) / post-annulation ( ionic, radical, pericyclic) and in vitro and in silico evaluation. Hyun-Joon Ha has obtained his BA from Seoul National University (1982) and PhD from Brown University (1987). He has done his Postdoctoral studies from Stanford University (1987-1988). Then he came back to Korea and worked as a Senior Research Scientist at KIST. In the year 1991, he joined the faculty of the Chemistry department at Hankuk University of Foreign Studies, and is now a Professor of the Chemistry department at the same University. His research includes aziridine chemistry, synthetic methodology, lipase-mediated reactions, asymmetric synthesis with publications of more than 140 papers and 25 patents. He serves as an Associate Editor of Asian J. Org. Chem. His research includes aziridine chemistry, synthetic methodology, lipase-mediated reactions, asymmetric synthesis with publications of more than 140 papers and 25 patents. Yuri S Varshavsky earned his Ph.D. degree in 1965 at the Kurnakov Institute of General and Inorganic Chemistry, Moscow, Russia. In 1967-1996 Yuri S Varshavsky was head of laboratory at the Lebedev Institute of Synthetic Rubber, St. Petersburg, Russia. In 1997-2013 he worked as head of research group at the Department of Chemistry at St. Petersburg State University. He is currently involved, as an independent scholar, in the interpretation of experimental data obtained earlier by him and his colleagues. Yuri S. Varshavsky has published more than 200 papers in peer-reviewed journals, delivered over 30 presentations at the international conferences, and received 10 patents. He also published (in co-authorship with M. I. Gelfman) a biography book about his scientific mentor, academician A. A. Grinberg. (“Nauka”, Leningrad, 1974). Varshavsky’s research interests are focused on the coordination chemistry of rhodium. Craig has completed his Ph.D at the age of 25 years from University of Manchester Institute of Science and Technology, U.K. and was taken on directly by AstraZeneca as a Senior Process Research Chemist in Macclesfield, U.K. He is now the Head of Synthesis for Nestlé Skin Health Research Chemistry for both medicinal and hydrogel research chemistry activities. He has contributed to more than 54 publications, patents and congress papers. Stef Stienstra works internationally as consultant or scientific supervisory board member for several medical and biotech companies, merely involved in biodefense. He is also visiting professor for Punjab University in Pakistan and Rhein-Waal University in Germany and visiting lecturer at the University of Rome Tor Vergata. He has finished his studies in Medicine and in Biochemistry at the University of Groningen in Netherlands and has extensive practical experience in cell biology, immuno-hematology, biodefense and transfusion medicine. His natural business acumen and negotiation competence helps to initiate new successful businesses, often created out of unexpected combinations of technologies. His good understanding of abstract science combined with excellent skills in the communication of scientific matters to non-specialists, helps him with strategic consulting at top level management. Stephen Hanessian holds the Ionis Pharmaceutical Research Chair at the Université de Montréal. He is also on the faculty in the Departement of Pharmaceutical Sciences, University of California, Irvine as the Director of the Medicinal Chemistry and Pharmacology Graduate Program. His research interests are in organic, bioorganic and medicinal chemistry with nearly 550 original publications and several patents to his credit. His recent book “Design and Strategy in Organic Synthesis” Wiley-VCH, 2013 is a widely acclaimed monograph. Professor Hanessian’s group conducts research into the total synthesis of natural products of biological importance, the design and synthesis of therapeutic products and the development of new methods of asymmetric synthesis. Anny Jutand has received the award jointly with Joel Moreau, for her unique and remarkable work in the elucidation of reaction mechanisms, the introduction of new concepts in organometallic and organic chemistry, and the visibility and international renown of French catalysis. John A. Soderquist completed his PhD in 1977 from the University of Colorado under the direction of Alfred Hassner. From 1977-9, he was a postdoctoral scholar under the direction of Nobel Laureate, Herbert C. Brown at Purdue University. His independent research career began at the the University of San Francisco in 1979 where he became Associate Professor and Department Chairman before moving to the University of Puerto Rico in 1983. Since 1988, he has been a Full Professor of Chemistry, publishing nearly 140 articles, contributing over 400 research presentations to scientific meetings and universities world-wide and directing the thesis studies of nearly 30 PhD students. He has served as a technical consultant for several chemical and pharmaceutical companies. He is interested in the invention and development of new asymmetric reagents and catalysts derived from organometallic derivatives of Main Group elements such as boron and silicon. We are also interested in the design and total synthesis of natural products and pharmaceuticals through the use of these novel reagents and catalysts. Much of our efforts in this regard have been directed toward the use of bulky silicon groups to influence the chemistry of organoborane processes in synthetically useful ways. Evgenii S. Stoyanov received a PhD degree at the age of 26 from Vernadsky Institute of Geochemistry & Analytical Chemistry (Academy of Sciences of USSR), Moscow, Russia, and the Doctor of Science degree in chemistry in 1991 from Mendeleyev University of Chemical Technology, Russia. Presently He is Leading Researcher at the Institute of Organic Chemistry (Siberian Branch of Russian Academy of Sciences), Novosibirsk, Russia, and leading the study of carbocations by using the solid superacids. He has published 139 papers in reputable journals. Carbocations saturated and unsaturated (vinyl): formation, characterization and reactivity; hydrogen bonding with unsaturated hydrocarbons ranging from weak to strong; interphases solid – gas and water – organic. Pradip K. Bhowmik is currently Professor of Chemistry in the Department of Chemistry and Biochemistry at University of Nevada Las Vegas. He obtained his Masters of Science in Physical/Organic Chemistry and Ph.D. in Organic/Polymer Chemistry from University of Massachusetts at Dartmouth and University of Massachusetts at Amherst, respectively. He received the 2014 POLY Fellow and 2014 ACS Fellow Awards for his outstanding scientific/professional accomplishments and service to the American Chemical Society. He currently serves on the editorial board of 11 technical journals and is an academic editor for Green and Sustainability Chemistry, American Chemical Science Journal and Advances in Research as well as an Advisory Board Member for InnoSense LLC, California. Liquid crystalline polymers, Light-emitting Polymers, Fire Retardant Polymers, Viologen Polymers, Poly(pyridinium salt)s, Nanostructured Materials, Organic Synthesis, Polymer Synthesis, Green Chemistry, Ionic Liquids, Liquid-crystalline and Luminescent Organic Salts, Anticancer Drugs, and Drugs for Alzheimer’s Disease.